What to eat for breakfast before a race depends on what time the race starts, the distance you're running and, to some extent, how your body reacts to food before running. 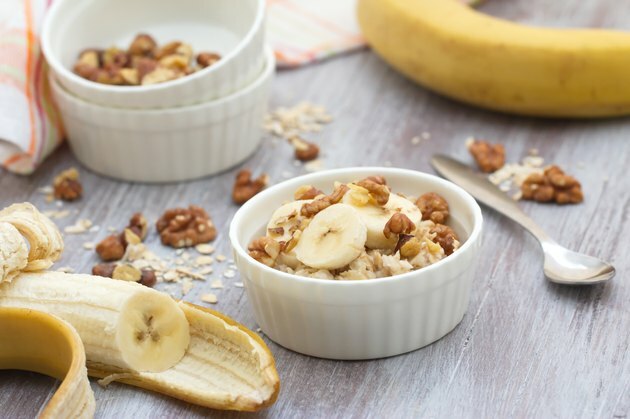 The longer the race, the more important proper fueling becomes, but even a short race deserves a well-planned breakfast to keep you moving at your best pace. Food contains three types of energy: protein, carbohydrate and fats. Before a race, carbohydrates should take precedence because they're rapidly broken down and made available as the primary energy source. Fats and protein-based foods take longer to digest, slow the absorption of carbohydrate and can also make you feel fuller and heavier, which can slow you down. Aim to take in 0.5 to 1 gram of carbohydrate per pound of body weight before your race; for longer races, stick to 1 gram per pound, the Salt Lake Running Company recommends. Eating two to three hours before race time gives you time to digest your breakfast so the energy it provides is ready to use. Running will divert blood from your stomach to your muscles, so the food you eat won't be properly digested. This can cause nausea, stomach pains or cramping. You can drink a sports hydration drink up to 30 minutes before the race for an extra boost if you can't eat before the race. While carbohydrates should dominate your pre-race breakfast, it's important to pick the right carbohydrates. Eating carbohydrates with a high glycemic index, which means they break down quickly into sugars and enter your bloodstream rapidly, can cause rebound low blood sugar when the sugars are quickly used up. For this reason, go easy on sweets for breakfast. Choose fruits such as a banana, which contain some fiber, which means it breaks down more slowly, as well as whole grains such as oatmeal. Include a small amount of low-fat protein, such as eggs or whey protein. Peanut butter and yogurt also make good breakfast choices. You might feel too anxious to eat before a race, or the race might start so early that you don't have time to eat breakfast. Your glycogen stores will last approximately two hours if you're working at around 85 percent of your maximum heart rate, according to the Ultra Running website. If you're running a 5k in 30 minutes, you might not need to eat anything before toeing the start line, as long as you've done your carb loading the two days before the race. However, a study published in the April 2013 issue of the "International Journal of Sports Nutrition and Exercise Metabolism" showed that runners ran faster after carb loading the day before and consuming carbohydrates the morning of the race. Is It Better to Eat Before or After Jogging?